1.We are not responsible for lost software and data! Please back-up! 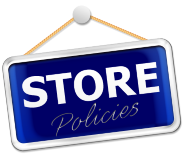 2.We are not responsible for items left in the store for more than 30 days! 3.We ONLY accept CASH or CREDIT, NO CHECKS! 4.Returns not accepted, ONLY exchanges for same item! at the time you dropped off your machine! YOU MUST PAY FOR IT IN ORDER TO TAKE IT WITH YOU! There is no net 30 days anymore. Everything is PREPAID!